Hi everyone, when summer is here I feel like I have a paint brush in one hand and a garden trowel in the other. Both are great ways to express yourself on a blank canvas! I created a tongue in cheek Garden Hours art journal page today to express how scattered I feel right now. Sometimes art journals are good that way! They don't all have to be masterpieces....doing something to record your feelings or just to have fun is a great way to spend time with your art. First I started with a magazine image. I found a full page picture which really looked inviting to me with the door opening into the garden. I fussy cut away all the inside parts so I would have room to write. Then the fun part, I got out my Helmar Decoupage & Craft Paste to adhere the image down into my journal using the handy little spreader that Helmar gives to you when you purchase the Decoupage & Craft Paste. I add a layer of the Helmar's Decoupage & Craft Paste over the top layer too, just to seal the magazine image. You can see how it looks when it is still wet on the picture on the left, but look how clear it dries! And please notice how flat the thin paper of the magazine is, that is so important when making collages!! We don't want wrinkled or bumpy paper! I ♥ my Helmar Decoupage & Craft Paste!! High school graduations have started here in my neck of the woods. I have the privilege of working with the youth in my church and one of the young woman just graduated. I put together a card and gift bag to give her and used Helmar to put it all together. I cut the bag and card with my Silhouette and put them together with the best adhesive for the job - Helmar 450 Quick Dry Adhesive. What I want to share today though is how I quickly attached the ribbon handles and made the flower embellishment. I used a wired ribbon for the handles and thread it through the holes in the bag. I placed Helmar Fabric Glue on the ends of the ribbon and folded them up to lay flat against the handles. Next up was the leaves for the little yellow rose. I used a sheer green ribbon and Helmar Fabric Stiffener and Draping Liquid. I placed a small amount on a paper plate and brushed it onto the ribbon with a foam brush. The glue takes a bit to dry, but after a few hours I gently peeled the ribbon off the plate and it was nice and stiff. I cut several leaf shapes into the ribbon with a pair of fabric scissors. The stiffener works great not only to keep the leaves stiff, but also keeps the ribbon from fraying. I added the leaves to the bag with Helmar Fabric Glue. The ribbon flower was first started with a length of ribbon and wire. I threaded the ribbon on to the wire. I pulled the length of wire together forming a circle. On the top I took another piece of ribbon and started at the center with Helmar Fabric Glue and wrapped the ribbon on itself making sure to cover the wire center. I placed this on top of the leaves with Helmar 450 Quick Dry Adhesive. As a finishing touch I wanted to add a little more depth to the flower and took a dark yellow marker to the insides of the flower. The finished flower with the sheer leaves attached to the bag. Thanks so much for stopping by the blog today. I hope you enjoyed today's tutorial. Greetings all Kathleen here to present to you "American Hero". Memorial Day; a day to remember all of those who have served and are serving in the armed forces to protect and defend our liberties and freedoms. With this in mind I decided to do a layout of my son's grandfather who severed and fought as a helicopter pilot in the Army. I wanted to showcase more on the side of what our service member see and endure while defending our country. 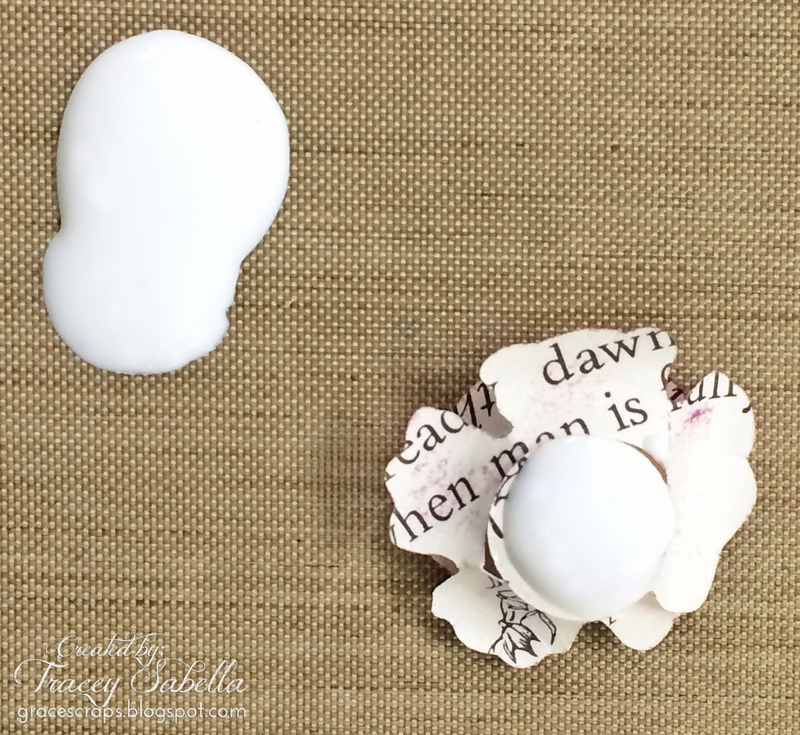 I like making my own molding paste because it is quick and easy and affordable. mix these three ingredients in a small container which has a lid for storing. If needed add a few drops of water to thin it out if it appears to thick. After applying my mask and first round of paints and allowing it to dry I apply a liberal amount of Helmar Craft & Hobby PVA glue to the back of the paper. Then flip it over and adhere to your base paper. Rough up the edges and it's ok if small tears happen. Now begin my layering with strips of paper torn to look like mountain landscape. I run a piece of paper from an old dictionary down the center then layer in a few tags. It's now time to get out those stamps and have fun stamping around the perimeter of your design. I even use a winter icicle stamp upside down! Last step is to secure my chipboard pieces in place. To give these chippies a grunge look I painted them first with Shimmerz Coloringz Chocolate Brownie, then spot painted with Shimmerz Vibez Egg Noggin. I used Helmar Acid Free glue to secure the last pieces in place. Thank you for stopping by the Helmar blog today, I hope you will give Helmar Craft& Hobby PVA glue and Helmar Acid Free glue a try on your next project! Please stop by my blog Talking Papers for a visit. I wish you a safe and memorable Memorial Day Weekend. May your creativity take flight! Pocket Letter Mail Art Fun! Greetings fellow crafters! Have you ever heard of Pocket Letters? I just recently "discovered" them, myself, and thought it would be fun to send my pen-pal something a little different. Of course I decided to dress things up with some simple embellishments and Helmar glue! The basic idea is that the page protector folds up and fits into a regular #10 envelope, so anything inside the pockets (the letter, stickers, and other goodies you want to send) needs to stay relatively flat. I started by trimming down some regular-sized foldover note cards to 2.5"x3.5" to fit inside the pockets, getting 2 small cards out of each regular one. Then I decorated some of the plainer cards with paillettes, small flowers punched out of vellum, and sequins, using Helmar Super-Tac Glue to hold it all in place. Into other pockets I slipped a couple of tea bags, a washi tape sampler, and a duo of sticky notes that I attached to a piece of card stock with Helmar Super-Tac Glue and then decorated with more small bits and a bit of pen doodling. Then, to dress it up in its closed state, I attached a loop of chenille yarn to the back of the bottom tier of pockets, leaving plenty hanging over to wrap around the top. Finally, I dressed up the outside of the envelope with a scattering of the same decorations that the cards got, being sure to keep them as flat as possible to avoid them getting coming off during transit. Now all that's left is to write my letter inside each of the cards and send it off! Wouldn't it be fun to get something like this in the mail? Or, better yet, to surprise a friend with it? Good morning everyone, Steph Ackerman here to share a fun canvas with you today. Helmar Decoupage and Art Paste is perfect for adhering paper to canvas. And, using the scraper, you can evenly place the Decoupage and Art Paste on your page before adhering. Then use the scraper to smooth out the paper once you have it in place. Once the paper has adhered, ink the edges of the canvas and the pattern paper with brown ink. I stamped the house three times. Using one for the base image, I matted it with chipboard. After coloring the images, I cut the windows, door and scalloped border from the 2nd image and the roof from the 3rd image. Using Helmar Liquid Scrap Dots, place several dots on the back of each cut piece and adhere to the base image. Allow to dry approximately 24 hours and you'll have permanent dimension. Fussy cut and emboss several fence posts and adhere them to the canvas using Decoupage and Art Paste. Stamp a row of sunflowers and color with Smooch Accent Ink. Carefully fussy cut the row of sunflowers and add it to the canvas using Liquid Scrap Dots. Next, stamp and fussy cut 3 trees and mat them with chipboard. Add color with ColorBox ink. Also stamp "home" and mat it with chipboard, placing it in the upper right. Finally, adhere the house over the trees and flowers using Liquid Scrap Dots. I wanted the house to be in the foreground. Hi, Veronica here today to share with you a steampunk canvas I did of my girl friend's wedding. The canvas is 8x8 and I used lots of Helmar 450 Quick Dry Adhesive which is the best adhesive around. Lastly I added gesso over the entire canvas then I started to doodle and also spray different mist on the canvas with overall coverage. This canvas was a lot of fun to make and I now hang it on my wall in my art studio so that I can cherish the memories of my friends special day. Thank you for stopping by Helmar today. I hope I have inspired you to use a little Helmar in all your projects. I want to show you the little wicker purse before anything was done . I used the Helmar 450 Quick Dry Adhesive to attach the frame and picture . Then I the next step was to add the burlap flowers and butterfly to the top section of the purse. This is the top half finished. The bottom half of the box I used the Helmar Tacky Craft Glue to attach the tag and quote and the burlap butterfly and the small flowers. This is the finished Little Wicker Purse. I really enjoyed doing this project it will hold some great little treasure in my Studio. I hope you have enjoy my Blog. Please leave a lovely comment and I will reply. Hello everyone, Kisha here today with a layout to share. Most that know me know how I love layers and layers of goodness on my projects. Today I'll show you how I use two adhesives to accomplish height and layers. To begin my basic layers I used Helmar 450 Quick Dry Adhesive. For all layers including embellishments, I always add adhesive about 1/4" away from the surface edge. This allows me to tuck more layers or embellishments under previous layers if desired. Hi Helmar Fans!! It's Tracey back to share a new project with you today. I've never worked with glue and foam before because you know how it is - the glue has a way of dissolving the foam, or it doesn't want to stick. Well Helmar's amazing Foam Glue is designed to work perfectly with foam!! Like all the other Helmar products I've used, I was very impressed with how it worked. Now about my project. 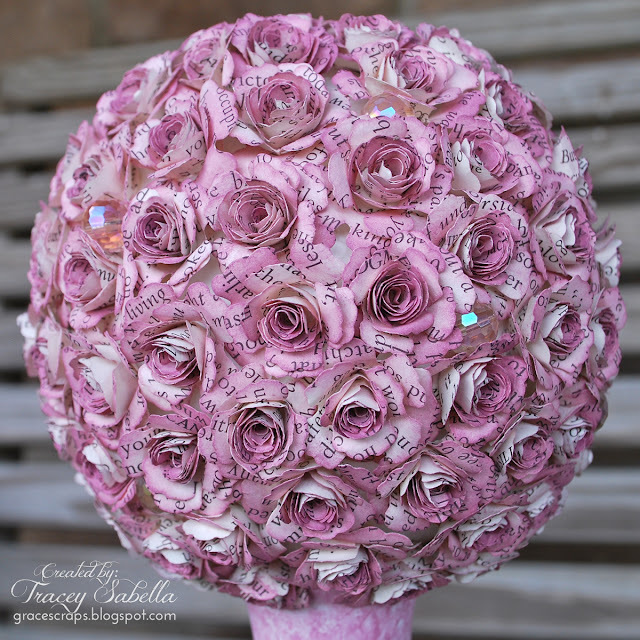 I was perusing Pinterest and saw a crepe paper flower pomander. I immediately envisioned a Bitty Blossom and crystal pomander - the perfect handcrafted Mother's Day gift for my sweet and deserving Mom and a great way to try out my Helmar Foam Glue. 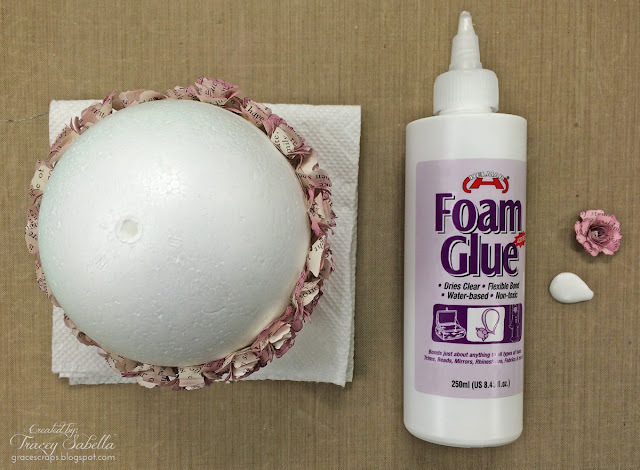 I used a 4 inch smooth styrofoam ball, but you could use regular foam as well, and vary the size according to your project. To apply the Helmar Foam Glue, simply squeeze out a small puddle of glue onto a craft mat or whatever nonporous surface you have a available such as a scrap of plastic from packaging. Dip the back of the flower into the glue as shown, then place onto the foam ball. When I got close to the bottom, I adhered a wooden candlestick that I had faux painted and set aside to dry. Then I went back and filled in with the rest of the flowers and crystals. A couple years ago I found a vintage poetry and short story book with extra thick pages. I cut these Spellbinder Bitty Blossoms flowers from those pages and rubbed the edges with Wisteria Mix'd Media Inx (Clearsnap by Donna Salazar). It took about 80 flowers to cover this 4 inch foam ball. 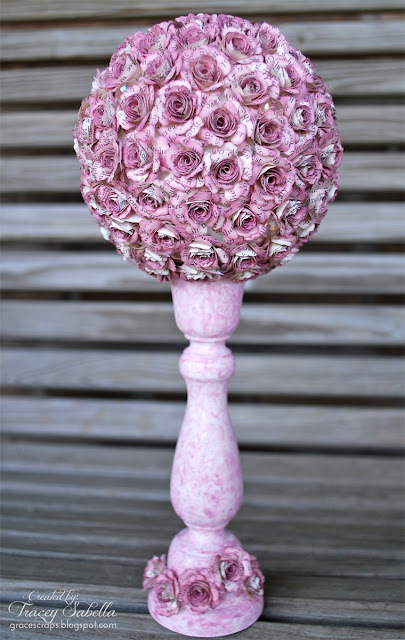 You could also create a similar pomander using premade flowers. The finish on my candlestick was created with more of the Mix'd Media Inx, which is water soluble, so I sprayed the surface with Helmar Crystal Kote Matte spray for a permanent finish that won't smudge. 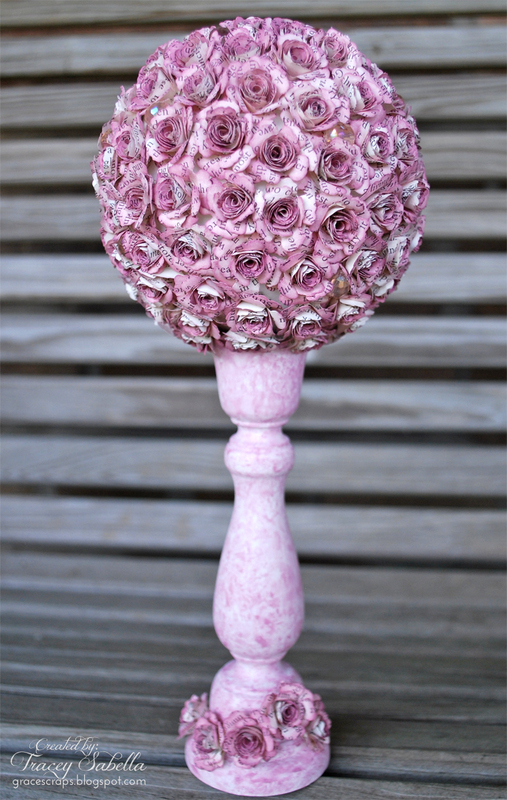 The flowers at the base of the candlestick are adhered with Helmar 450 Quick Dry Adhesive. I hope you had a lovely Mother's Day!! Hello everyone Vicki-Ann here. Today I am making a storage caddy for my desk.. I have seen these made a lot and have always thought they looked just the thing to hold my pens and bits in. I have always seen them with just the pattern paper and all the metal and flower embellishments. They are lovely like that but that is just not me.. If anything sits still long around here it gets my collage Art on it. So to start I first added Gesso to all the MDF pieces. Then painted in my favourite DecoArt colour of Sea breeze. Then I got a baby wipe and painted with it, in the colours of Vivid Violet and Desert Turquoise. This is the side I am using for the background of my collage. So for the collage I used the Helmar Decoupage and Craft Paste as this was something that was going to get some wear and tear on it sitting on my desk. I thought I really needed to have it glued on well and this worked wonderfully.. Here is the little guy I drew getting glued and then sealed down with the Helmar Paint/glue spreader, it really gets it on well with no bubbles.. He had lots of little pieces to him so this worked a treat. This is how I did all the collage on the storage caddy. I used some of my own Art collage that I have copied on my printer from my sketch book and Art Journals. Some copies from last years Index card a day challenge. Some from the great club I am in called The Artstronauts Club with Teesha and Tracy Moore. Every Monday we get a free collage sheet to use and there is always some new and wonderful images to play with. I also doodled and wrote some words, Create and Dream made it onto the back and the side. So time to put the pieces together and for this I grabbed the wonderful Helmar 450 quick Dry Adhesive. It was terrific, these pieces where flopping everywhere but a quick dash of the Helmar 450 Quick Dry Adhesive and a little hold by me and in a minute they where in place.. Once all the pieces where in place I gave it 2 coats of the Helmar Crystal Kote Matte Spray to seal it all.. Some more photos of it now its all together. they all worked a treat.. So hope you give collage a try.. You will end up with a one of kind project that I guarantee no one else will have..